Location: San Secondo Parmense, Italy. 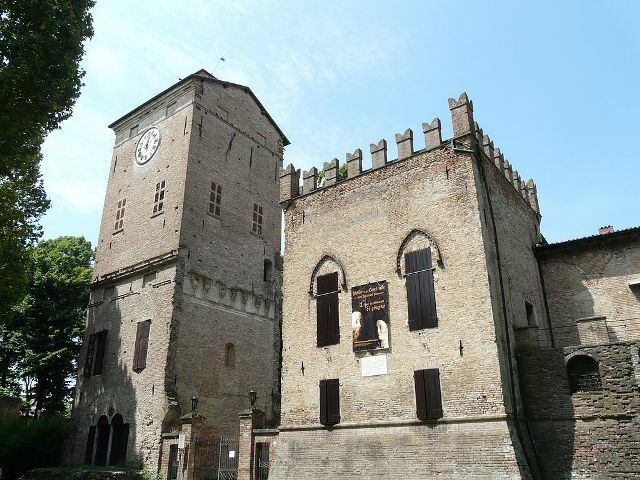 Notes: Rocca dei Rossi is a castle located at piazza Mazzini #12 in the town of San Secondo Parmense, Province of Parma. in the Italian region Emilia-Romagna. A different Rocca dei Rossi, also known as Castello di Roccabianca is located in the town of Roccabianca.Only the northwest wing and the northeast façade remain of the 16th century structure. During the last part of the 19th century, a large part of the castle was destroyed. The Renaissance courtyard, the main staircase and the reception hall, and the frescoes on the piano nobile remain. In 1983, an earthquake caused considerable damage to the building, requiring extensive restructuring. Today, guided tours of the castle are held regularly with performers dressed in historic costumes. In the first week of June, the Rocca provides the stage for a traditional Palio of San Secondo, contested among the various contrade of the town, and the theatrical representation of the marriage between Pier Maria III de' Rossi and Camilla Gonzaga, originally celebrated on 13 February 1523.